ASEEES Commons is a social network for members of the Association for Slavic, Eastern European, and Eurasian Studies. ASEEES supports teaching, research, and publication relating to the study of the region and has cultivated the field’s intellectual landscape for over fifty years through its chief publication, Slavic Review. The Association for Jewish Studies is a scholarly society and professional organization that represents Jewish Studies scholars worldwide. It is committed to advancing research and teaching in Jewish Studies at institutions of higher learning, as well as to fostering greater understanding of Jewish Studies scholarship among the wider public. 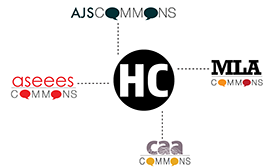 AJS Commons provides its members with a way to connect through groups and discussion, and to publish and share their work online. MLA Commons provides an online, collaborative workspace for members of the Modern Language Association. The MLA is a leading advocate for the study and teaching of languages and literatures and publisher of humanities research. It also serves as a clearinghouse for professional resources for teachers and scholars. CAA Commons is the online social community for CAA members to share and discuss their work. CAA members are scholars, artists, designers, museum professionals, arts administrators, educators, conservators, critics, and anyone working in the visual arts. As an organization, CAA advocates for the visual arts, produces resources for use in the field, supports professionals in the visual arts, and organizes the largest annual conference in the world for the profession. Learn more about CAA, our Annual Conference, and how to become a member.